When she was asked of her opinion of the suprise that the Fire Department had in her operation she stated "I think everybody needs to take a look around to see what needs to be done to protect the Mother Earth, and not take her for granted". Lisa Ogden (below) is currently organizing a Nationwide River Beach Clean Up. She is being helped and supported by many groups and organizations. She is especially grateful to the MSN Internet Community called 'Native American Living'. She states that "it is a blessing from the Creator for the people on there , how they have joined together and created all the clean up groups for the 'big' April clean up". Lisa is a quite woman and usually don't say anything unless it is filled with meaning and truth. 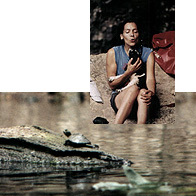 As Lisa visits with her new found friend (below) while resting from a canoe trip down the Jacks Fork River in Missouri. Lisa shows great delight in sharing in harmoneous relationship with vurtually everything living. When the "River Woman" was asked what others could do to get involved she said "Get yourself some trash bags and head on down to the river and pick things up"
She alse said in a smiling voice that "while on the way to the river you can ask your friends to come and help". Lisa Ogden .....definantly a 'friend of the rivers'. If you would like to get involved with Lisa and her river projects just write to us and we will forward your letters to her.